Mango butter is cold expeller pressed from mango seeds. It has vitamins and nutrients for skin and hair. It has a high level of unsaponifiable fats and is high in antioxidants! It’s similar to cocoa butter in many ways. It has a high content of oleic and stearic acids. It has moisture sealing properties. It’s off white in color. It doesn’t smell like mangos. It has very little scent, maybe slightly sweet and nutty. It’s non-greasy and absorbs into skin easily. It’s a natural emollient, wound healer, UV protectant and skin regenerator. In raw form, at room temperature, it’s hard to spread. Once warmed it liquifies and is easier to use. It melts upon contact with skin. It's a semi-hard texture, a “soft solid”, softer than shea or cocoa butter. Often mixed with coconut oil or shea butter. It can be refined or unrefined. Most products on the market contain the refined version reducing manufacturer costs. Unfortunately, during the refining process most of the beneficial vitamins and minerals are lost. The refined version is less effective overall. The unrefined version maintains beneficial vitamins, minerals and antioxidants! No chemicals have been added to strip away it’s nutrients. Organic, unrefined, mangos offer exceptional nutrient content! Discover its benefits and how it's used in home crafts! Find mango recipes: soap recipes, homemade body butter and hair treatments. Mango butter is an exceptional base ingredient for body care products and soap recipes. 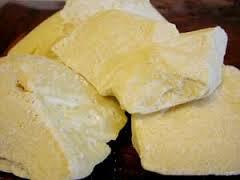 Use it for making homemade soap, lotion bars, creams, body butters and lip balms. - It adds strength and conditioning to soap. - Use it from 5% and up in soap recipes. - Combine it with calendula oil and flax seed meal. Soothe and soften dry flaky skin. RECIPE # 1: "PACIFIC SUNSHINE SOAP RECIPE"
(Makes 4 lbs. (approximately 16 - 4 oz bars). Looking for the right soap making oil? Find it now! HAVE YOU CHECKED AMAZON, LATELY?